It's been a year already? Wow! He's such a handsome, big one year old! Happy birthday, Mateo! And that Pat The Bunny cake is over the top. You are truly the best mom on the block! Aw, Happy Birthday! What a muffin!! Happy birthday Mateo! He is just too precious! One day he is going to look back and give you a big kiss for making him such a beautiful 1st birthday cake - nice job mom! I can't believe it's been ONE YEAR? Doesn't it just fly by with number two? I'm still amazed that a 6 week old newborn can walk and even hold his own in a tug of war with our Mateo! Have BIRTH day to you, Mama! I love that cake! It is beautiful. You are so talented! I love Pat the Bunny, it was the first stuffed toy I bought for my oldest, the day I saw her for the first time on an ultrasound, when she looked still like a little peanut. We have passed that stuffed animal down to every child we have had so far, and hope to continue the tradition if we have more. I am looking forward to seeing your recipe. It sounds delicious. It is a hard lesson for us mama's as well that nursing does not fix everything. Yesterday morning I was snuggling my youngest who was feeling sick. I suddenly had a moment of missing nursing him. I was remembering the times that he felt sick and I nursed him to make him feel safer. Plus a memory of when he never said he loved daddy more!! That cake looks wonderful!! Happy birthday Mateo. Love the cake too...it looks nice from the photos! Thanks for the birthday wishes, everyone! I can't believe it's been a year either. I was pretty happy with how the cake turned out. Stay tuned for lots more pictures. Happy Birthday Mateo! He got a lovely cake! I am so in love with your blog. You're a great mommy. I wanted to do a Pat the Bunny for my daughter's first birthday but i was riduculed that it wouidn't be a fun enough theme for our party guests! I'm so glad you did it and that cake is so much more beautiful than anything I would have done. The first book my daughter ever read was Pat The Bunny and she was 4 months old. I will forever love that book! Now that i am pregnant with my second maybe I will take a little more of my own creative advice! You're blog is so Awesome. Already a year old! It seems like I was just congratulating you on his birth. Mine will be a year old in about four months. Where does the time go? And a Pat the Bunny cake is such a sweet idea! Pat the Bunny is such a great theme! Happy Birthday, Mateo! What a cutie! This is so cute. Happy Birthday! Ahhh - what a sweet post! Happy birthday to your sweet baby! 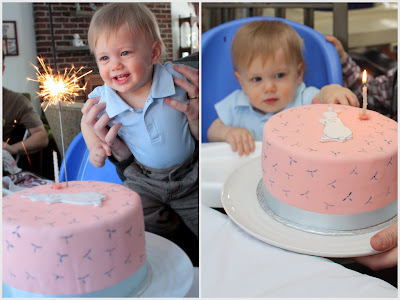 My gosh, Aimée, the cake is gorgeous and that little boy of yours is just so handsome! Happy belated birthday to the little guy! 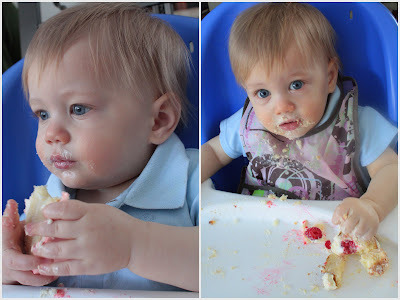 I cannot believe he's 1 already, Aimée! What a beautiful, happy baby he is! Happy belated birthday to sweet Mateo! 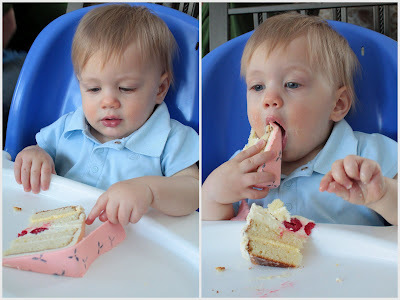 the cake and your sweet baby... happy birthday mateo! Happy birthday to your gorgeous little boy!! I will be looking for that cake recipe. It sounds delicious. I had thought of a Pat the Bunny quilt for his birthday, but figured he'd be embarrassed to be hanging on to it or cuddling when he's ten. So, I chose another theme. He can take this one around the world! Happy Birthday, my sweet! That means I've been reading for almost a year! Happy Birthday to the little guy. CUTE Bébé! He's adorable. He could be a model baby. Happy Birthday Mateo! The cake looks killer. Must have the recipe. Also, I received your package yesterday. Thank you so much! I'm planning on my blogging about it, but I want to come up with a dish using the spice blend first. And the tonka bean! How cool! I've never seen a tonka bean before. Thank you thank you thank you! awww, Pat the Bunny... such a great idea. The cake looks adorable. Happy Birthday to your little guy! Happy birthday Mateo! (love his name,BTW!) He does have gorgeous blue eyes. I'm a sucker for blue eyes. That was hilarious about nursing no longer being the solution to all his problems. LOL!